When Tom Paine arrived in Philadelphia from England in 1774, the city was America's largest port. Unfortunately, the seasonal dangers of the rivers dividing the region were becoming an obstacle to the city's continued growth. Philadelphia needed a practical connection between the rich grain of Pennsylvania's backcountry farms and its port on the Delaware. 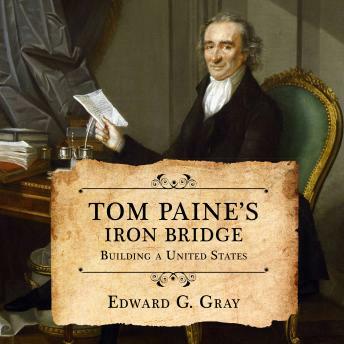 The iron bridge was his solution.The bridge was part of Paine's answer to the central political challenge of the new nation: how to sustain a republic as large and as geographically fragmented as the United States. The iron construction was his brilliant response to the age-old challenge of bridge technology: how to build a structure strong enough to withstand the constant battering of water, ice, and wind.The convergence of political and technological design in Paine's plan was Enlightenment genius. His dream ultimately was a casualty of the vicious political crosscurrents of revolution and the American penchant for bridges of cheap, plentiful wood, but his innovative iron design became the model for bridge construction in Britain as it led the world into the industrial revolution.